The cards contained in this packet can be used as traditional flashcards or 3 Part Cards. The 3-Part Cards are Montessori inspired. Rote memorization can be difficult for children with dyslexia. 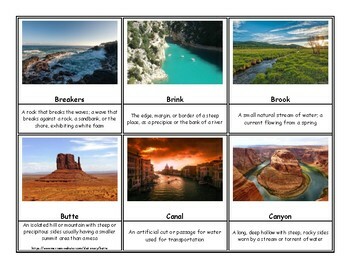 The purpose of these cards is to assist in the memorization of terms through a multi-sensory method. These colorful cards provide visual stimuli, can be read aloud for auditory stimulation and can be manipulated through matching for kinesthetic stimulation. Two sets of cards are required to use the Montessori 3-Part Card method. The first set of cards, which are not cut, are the control cards. These whole cards serve as an answer key for students. 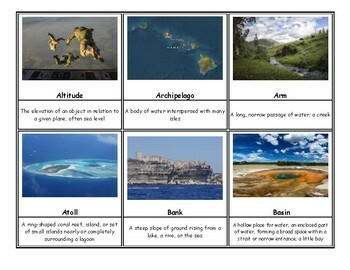 These can be reviewed before working with the divided cards or can be used simultaneously with the divided cards. 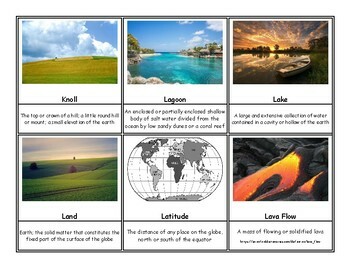 The divided cards are used as a matching game in which the student matches the definition with the correct term and photo. 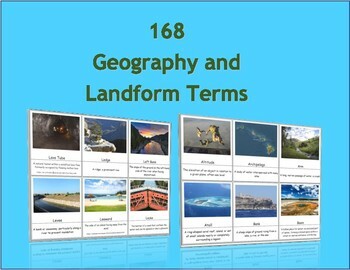 Many terms have similar definitions and can be used interchangeably with one another; therefore, each term in this packet has different a different photo.